Chris Cooper was in the Michigan woods when he caught a glimpse of this shy white weasel peeking out of a hollow tree to say hello. The weasel is a species of mustelid distributed from southern Canada throughout all the United States and Mexico, southward through all of Central America and into northern South America. The long-tailed weasel is the product of a process begun 5–7 million years ago, when northern forests were replaced by open grassland, thus prompting an explosive evolution of small, burrowing rodents. The long-tailed weasel's ancestors were larger than the current form, and underwent a reduction in size to exploit the new food source. The long-tailed weasel arose in North America 2 million years ago, shortly before the stoat evolved as its mirror image in Eurasia. The species thrived during the Ice Age, as its small size and long body allowed it to easily operate beneath snow, as well as hunt in burrows. The long-tailed weasel's growth rate is rapid, as by the age of three weeks, the kits are well furred, can crawl outside the nest and eat meat. At this time, the kits weigh 21–27 grams. At five weeks of age, the kit's eyes open, and the young become physically active and vocal. Weaning begins at this stage, with the kits emerging from the nest and accompanying the mother in hunting trips a week later. 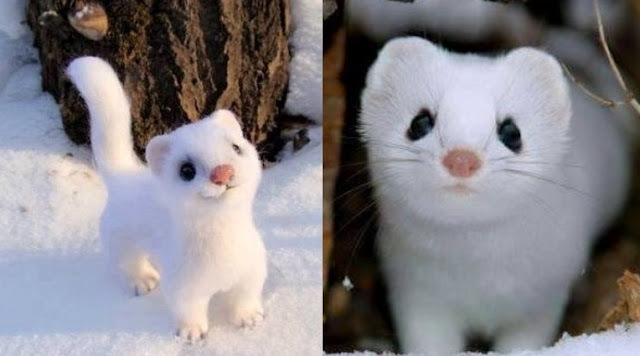 Responses to "Meet the world's cutest wild snow-white weasel"